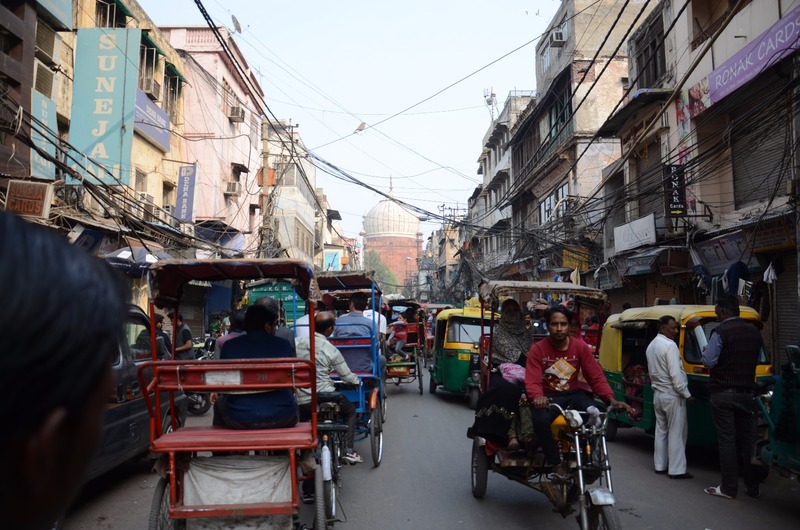 Ernst's Economy for you: Impressions from India, Pt I: How India’s traffic chaos can teach us in the Western world a lesson. 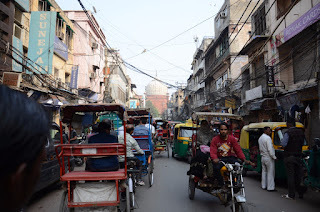 Impressions from India, Pt I: How India’s traffic chaos can teach us in the Western world a lesson. The last two weeks I have been the guest of India; the second country in the world, when it comes to population. I, together with a group of colleagues from my employer – a large supermarket chain in The Netherlands – had the opportunity to visit one of our key suppliers in India, in a sheer unforgettable business trip. We all resided in Noida, a neighbouring city of Indian capital Delhi, and that was also the city were the supplier was established. It was the trip of a lifetime for me and the hospitality and friendliness of the Indian people have been heartwarming! I genuinely loved this country and its sometimes peculiar, but special, culture during the last two weeks made an enormous impression on me. The streets are litterally clotted with masses of garbage and people living on the streets in tents… or just in a blanket or sleeping-bag. Beggars approach you everywhere and street sellers of litterally everything don’t take a simple ‘No’ for an answer, but try to persuade you into buying some of their stuff with enormous perseverance. Poverty and backwardedness is always extremely palpable and tangible in India, wherever one goes. And so is the sheer wealth at some places. These are the sometimes painful consequences of life in a Third World country, being in an unstoppable march towards more business success and prosperity than ever before: the dot on the horizon is very much visible, but the road towards it is long and winding. 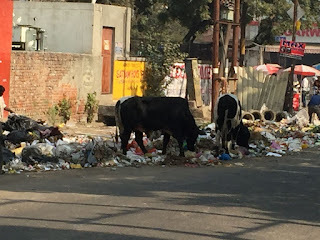 Tens of thousands of stray animals (mainly dogs and (holy) cows) are walking in the streets and straight through the dense traffic or they are browsing through the massive stockpiles of garbage for their daily meal. 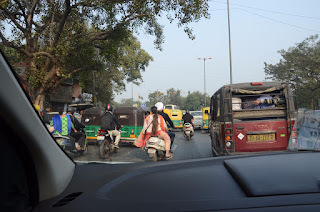 One thing that probably strikes every Western visitor is the blatant chaos of Indian traffic and the 24*7 continuous honking of cars, scooter cars, motorbikes, lorries, rickshaws and anything else with a horn mounted (i.e. which is everything, except people, cows and dogs). “I honk and therefore I am”, could be a statement of an Indian René Descartes these days. Where excess honking is a habit in traffic that can make people angry in about every other country in the world, the Indians react indifferent or even with an understanding smile. Some lorries even beg their fellow traffickers to user their horn as a warning signal! When you honk, the Indians might give you a little bit of space. Just enough to not directly crash in the fifteen cars, lorries, rickshaws and scooter-cars immediately surrounding you. For the rest the survival of the fittest rules in Indian traffic: if you don’t fight for your square meter of street space before you, someone else will claim that. Giving precedence to other traffic will make you a fool, who will wait forever. Simply because nobody else will give precedence to you. So you blow your horn with a confident smile, step on the gas and fight for every meter of space, without stopping too clearly for the other traffic or for pedestrians and bikers. They are aware of you and won’t move one centimeter to both sides. If you can pass somebody with 20 cm of space, you clearly gave them too much room to drive. Stopping for other traffic is futile, so you blow your horn once more and pass them with serious speeds. Who goes first, wins. The others are clearly sheep in search of a shepherd. At this moment you might wonder if the daily Indian traffic is not laden with the most gruesome accidents, seeing their driving style. Well, it isn’t actually… That was the most amazing discovery that I did during my fortnight trip to India. Taking the constant, 24*7 traffic chaos in consideration, there were amazingly few accidents. To be honest: I only saw one small quarrel caused by a tiny traffic accident, to be honest. For the rest, the traffic in Delhi seemed to run like a Swiss clockwork in all its chaos. And that amazing fact set my mind to work: what if the totally disorderly “outlaw state” of Indian traffic, was actually safer than the watertight web of traffic regulations in The Netherlands?! It was almost impossible to believe! The Netherlands is a country with a huge web, consisting of thousands and thousands of traffic rules for every possible situation and far, far beyond. Pedestrians and bikes are protected by traffic laws that declare cars guilty for every accident, in which they are involved with the former. Was the bike riding through red? Not paying attention to approaching cars? Riding in the middle of the road, while ignoring the other traffic? Looking at this telephone, while riding? Never mind! The car is guilty anyway. The logical consequence is that bikers in The Netherlands stopped paying attention to the other traffic at all, until they find out the hard way that they are perhaps legally invulnerable, but far from immortal or physically invulnerable. The same is true with other participants – cars, trucks, bikes and pedestrians – of Dutch traffic. Their instincts for the strange habits of their fellow-participants in traffic have all been replaced. Either by the vast web of Dutch traffic rules or by the pseudo-safety of airbags, extra strong cage constructions in cars and all kinds of modern technology, like anti-slip software and brake assistants. Where machines get smarter over the years, the humans operating them become inevitably less smart and less skilled. That is a law of nature! Or do you still know somebody, who can calculate his supermarket sales slips by heart or find a complex route without the usage of a navigation system?! So perhaps the Indians, with their utterly chaotic and seemingly hopeless traffic, are touching a sensitive point of the West indeed: that too many traffic rules and too much technology actually not make the traffic in Western countries much safer, but rather to the contrary. People lose their skill set and their ability to watch out for themselves. That would be a surprising lesson to learn for us. This lesson is extremely hard to believe, but Indian traffic might prove that it could be right anyway. Then it would be an extremely important lessons for traffic officials too. So step in your car, blow your horn and let the survival of the fittest begin! In the meantime, I say “Hi” from India.